During the day, you work your job. Nights, weekends and mornings? It’s all about the side hustle. Starting a side hustle can help you diversify your income and give you the opportunity to try something new. While many side hustles stay on the side, at some point you might wonder whether you can quit your day job and take your hustle full-time as an entrepreneur. That’s no small task, and not everyone is cut out for the entrepreneurial lifestyle. But these successful entrepreneurs proved it can be done — and they share their best advice for anyone thinking of making the leap. Kristin Berry moved to New York City and scored a job in pharmaceutical advertising. Though the job was great, she still needed to earn extra money just to pay bills and have some money left over. So Berry took her graphic design skills to work and opened up an Etsy shop in 2011, selling logo designs, illustrations, and more. While she started out with multiple offerings, she realized there was one thing that was selling like hotcakes. “I quickly realized that the wedding products were selling faster than any others, and my illustration style lent itself perfectly to the designs,” she says. Two years into her side hustle, she hired her first part-time employee. After a few years of work, she quit her full-time job in July 2015 to pursue her side hustle full-time. Now she has launched her stand alone site, MissDesignBerry.com and is close to having a million in revenue. “I now work at home and have over 20 women who work remotely for me, allowing them to each have their own creative side hustles as well,” explains Berry. Her advice for others looking to start a side hustle and make it full-time? Just start. “There is no perfect time, perfect product or perfect idea. The biggest thing I have learned during my adventures in owning a business is that most people don't start out with their whole business planned out,” she says. She also advises would-be entrepreneurs not to quit their day job right away, but to take careful, consistent steps which will turn into great strides. Skot Carruth started his career as an investment banker. He thought he chose a safe and traditional career plan, and had plans to go to business school, but his plans disappeared after he lost his banking job during the financial crisis. After bouncing around as a consultant, he ended up as an accountant. Though he had a job, he wasn’t thrilled about the opportunities that lay ahead. He strategically used his day job as a way to fund his side hustle, creating Philosophie, a design innovation company. “The day job gave me the runway to bootstrap Philosophie with my cofounder, who was also working part-time while finishing his degree,” he says. Eight years after starting this side hustle, the company has 40 employees across three offices and earns close to 8-figures. Julie T. Ewald was enjoying life living abroad in Italy with her then boyfriend — but found she was dead flat broke. To earn more money, she tried her hand at freelance writing. “But I just couldn't make it stick,” she says. The following year she returned to the States working several gigs and decided to try freelancing again. She signed up for Upwork (formerly oDesk) and began to apply for jobs. To help boost her skills she focused on mastering her craft and building her client base. “I continued to hone my skills and learn more about digital marketing, as my writing was being used for articles, blog posts, and website content for various businesses and brands,” she says. As her skills improved, so did the work. She got so busy that she was at a standstill. She either had to say “no” to new clients or do something completely different. So she started Impressa Solutions, an inbound marketing agency with a team of employees so she could scale her work. What started as a side hustle in 2012, became a full-fledged business just 10 months later. Ewald now coaches others on how to get started with freelancing in the online space. Amani Roberts was working in corporate America when he decided to start DJing on the side in 2008. To get started, he would use his free time to grow his side hustle. “I would gig out on nights and weekends and grow the business,” explains Roberts. 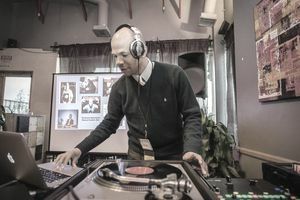 While juggling his full-time job, he continued to DJ on the side and build his connections. He networked in his free time, while also honing his skills as a DJ. Within a few years time, he was making decent money from his side hustle. “I realized it was time to go full time when the revenue I was earning was half of my current salary. This gave me a good foundation to build upon while going full-time,” he says. By 2012, he had his own DJ company, The Amani Experience. Roberts recommends that other side hustlers join specific networking organizations and to also get creative on how you can earn money. Roberts doesn’t just DJ, but diversifies his revenue streams. “I DJ events, create original music for commercials and videos, and I also teach DJ lessons,” he says. He warns, though, that while going full-time can be a dream for many, it’s not an easy transition. “There will be many tough times and it isn't easy. Perseverance will make the journey worthwhile,” he says. Melanie Lewis was working as a freelance writer when her friend recommended she check out Rover.com, a pet sitting website for dogs, in order to earn extra cash. Lewis thought it would be a great fit. “I have two dogs of my own, and they love puppy play dates, so pet sitting was a perfect way to not only make some supplemental income, but also socialize my pups,” says Lewis. Pet sitting can be a saturated market so Lewis knew she had to do something different. “From the very beginning, it was important to me to set myself apart from more traditional pet sitting and boarding facilities by offering my furry clients a home away from home experience,” explains Lewis. Because of her outstanding service, she was able to grow her business and get repeat clients that kept coming back for more. She started the side hustle in December 2015 and in a matter of months was booked up. “I was always fully booked, and I started booking new client stays up to four to six weeks out,” she says. “I decided to become a full-time pet sitter when I was able to hit my max capacity of dogs every day.” That day came just three months later in March 2016. If you’re a side hustler wanting to take your gig full-time, Lewis recommends doing a check-in first. “The question to ask yourself before you make the switch to full-time is whether or not you have the capacity—time, energy, enthusiasm—and financial stability to do so,” she says. That last bit might be the most important: While any entrepreneurial endeavor involves a degree of risk, if you don’t have the means to support yourself you’ll just end up back in your 9-to-5.